The Relics were transferred to the Treasury of the Rare Collections of Christian Antiquity in the Vatican where they remained for three years. In 1805, a priest from Mugnano del Cardinale, Don Francesco De Lucia, traveling to Rome with his newly appointed Bishop, requested and eventually received the relics of this Martyr “Filumena” to enshrine in his village church in Mugnano del Cardinale, Av, Italy. To this day, miracles are numerous and brilliant. Mic was given holy oil from St. Philomena’t Sanctuary in Mugnano, Italy and he mixed the holy oil with his oil paints used to paint her! Father Mike cried as he unveiled Mic’s painting. The wife of the man who commissioned Mic to paint this saint has been diagnosed with an incurable melanoma cancer on the inside her body. After talking to his parish priest Fr. 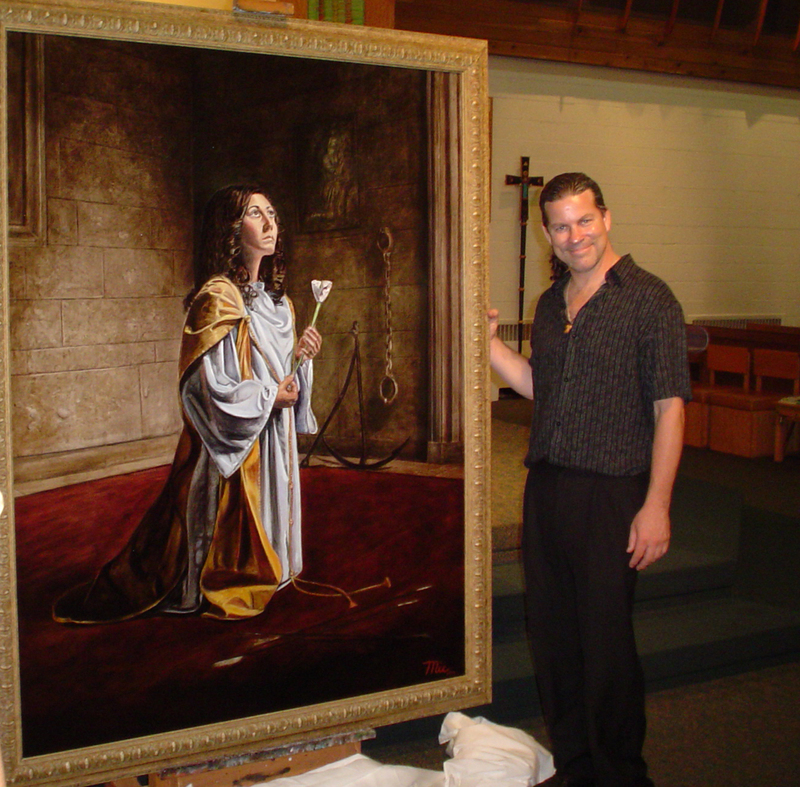 Mike of St. John Vianney’s Church, the man decided to dedicate a painting to St. Philomena who has been known to heal tough causes. Since that day, his wife has amazingly been in somewhat of a remission…something that has not happened since she was diagnosed. There was a private unveiling last evening, Wednesday, August 4th for the family that commissioned Mic…who wish to remain anonymous…followed by a mass and unveiling for the church. It was so touching. There was a testimony by Rosario Rodriguez, a young lady who was shot a year ago in an armed robbery…the bullet just missed her heart by 1 cm..and after much time in surgery and many prayers to St. Philomena for intercession in her healing…she lives. She said St. Philomena, who is constantly by her side, helped intercede in saving and healing her. Needless to say, it was an emotional, beautiful ceremony…St. John Vianney’s Church on Clyde Park is the permanent home for Mic’s painting. I echo my sister’s words: It was a beautiful Mass. The unveiling, dedication and blessing of the painting were moving beyond words. We were honored to be there! Philomena’s miracles are un stopable. When My wife got her first pregnant, we started praying through the intercession of the virgin martyr st.philomena. Surprisingly, she gave birth peacefully on Philomena’s feast day, that is on11th.8.2013. Our family is proud of st.philomena.